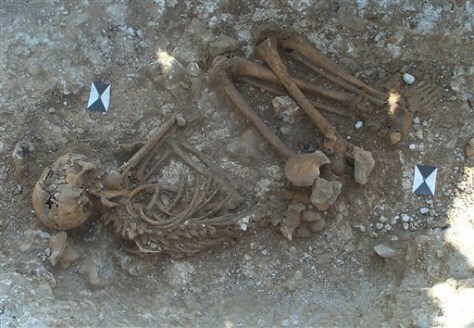 This image shows the remains of an early bronze age burial. Although it cannot be seen in this photograph, this person was buried wearing a necklace made from amber beads. The body is in a flexed position, reminiscent of a sleeping pose. A wealthy young teenager buried near Britain's mysterious Stonehenge monument came from the Mediterranean, scientists say, proof of Stonehenge's international importance even in prehistoric times.